SCSU is 2-0, but struggled to escape the Mary game with a win. Considering what the Huskies return on offense, they should look much stronger than they have. UMD has destroyed both opponents by halftime, looking fantastic on defense as well. Those wins came over Minot State and Moorhead, but still, the Bulldogs more than took care of business. I’m pleased to see this is one of the Thursday games, as SCSU is always a threat to UMD’s NSIC North supremacy, but I like the Bulldogs to blitzkrieg the Huskies in this battle of canines, with the game basically over by half. Far more interesting a matchup than most would’ve figured just a few weeks ago. The Golden Bears nearly knocked off contender USF and then throttled the mid-level UIU Peacocks. The Concordia of the last two seasons would not have beaten UIU, much less in a one-sided manner 34-7. Dom McKinzy has provided steady leadership and a passing threat in an offense that previously struggled to get production from the quarterback spot. Shaq Johnson is also turning into one of the NSIC’s better running backs, netting 110 yards on the ground a week ago, along with 2 catches for 26 yards and a score. Given how Mankato got cut-up by big wideouts down the field against Augie in week two, CSP should pose a threat as well with speedster MJ Williams and one of the best tall wideouts in the league in Marcus Gustaveson. Mankato was a squad that I had #1 in the country in my D2 Top 25 ballot. That said, I’ve now moved them back a spot after two weeks. Simply put, the Mavs front four on defense needs to ‘get home’ better than what I saw in person in Sioux Falls. Augie had a nice pocket to throw from and the MSU secondary struggled to make plays on 50/50 balls and got exposed to the tune of 450 yards passing by a squad that didn’t appear to be high-flying. The good thing for MSU was the offense responded to the call as the game continued, netting 570 yards of offense and hitting big plays down the field to superstar wideout Shane Zylstra. The 40-yard jump ball touchdown from Schlichte to Zylstra merely shows how this Mankato squad can strike with the big play. Must be nice for Coach Hoffner to know he’s got that type of play in his back pocket while typically choosing to go with the safer offensive approach with ground and pound. With DE Zach Dodge on the mend and returning, MSU should get more dangerous upfront. While CSP is certainly a threat to the Mavs, I don’t think Concordia is ready to beat a top 5 team on the road just yet. Look for the Mavs to have a strong rebound game after a disappointing performance a week ago at Augustana but I think CSP could stick around in this one. MSUM is a very young squad that’ll be a in the NSIC in a year or two but last week the Dragons just didn’t compete at Duluth, falling down 28-0 after one quarter and 50-0 after three. Bryce Meehl won the starting QB spot in camp but threw just 5 passes and wasn’t around for long against UMD. Jakup Sinani took the controls the rest of the football game and wasn’t good but wasn’t terrible. Personally, I really like what I saw from Sinani a year ago when he replaced Demetrious Carr. I wouldn’t be shocked to see both signal-callers as the season continues. 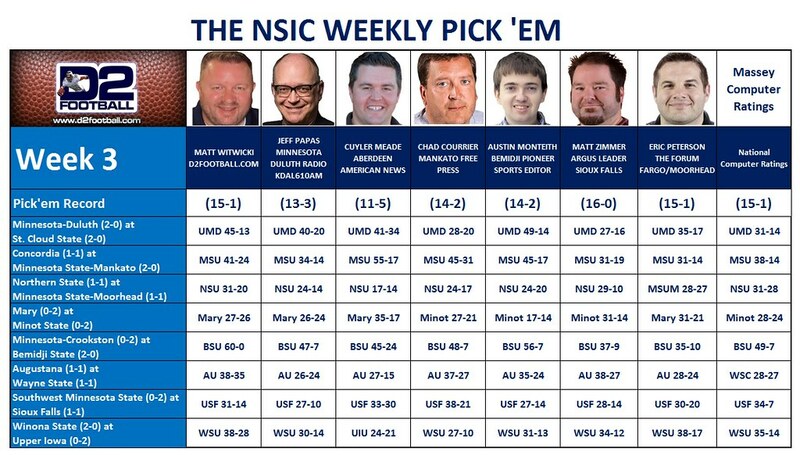 NSU had a great showing week two, dismantling Minot State in the Thursday night special. The Wolves established the ground and pound offense, along with hitting some big plays through the air. QB Hunter Troutman finished with 288 yards passing and 4 scores. Easily the best output I recall him having with NSU and could be a sign of the Wolves becoming more explosive in the passing game. After two weeks I feel the Wolves have a more experienced squad that also plays better defense. I like NSU in this one if they can control the ball with their rushing attack. Not a lot to see here for the casual observer. Both teams are in the early stages of needed rebuilds and both looked real real bad a week ago. That said, “The Battle of the Big Lake” does mean a heckuva lot up in central North Dakota for bragging rights and for recruiting purposes. Somebody is going to reach the pay window in this one, and I was easily more impressed with Mary in its opening one point loss than anything I’ve seen from Minot so far. At this point I like the offensively approach of Craig Bagnell, and I will give him and his squad the nod in this North Dakota struggle. The Highway 2 rivalry (Hub Cap Game) has seen Bemidji dominate with just one setback since it began in 2004. The initial look at this game does not suggest we’ll see a change in the expected outcome of this series. Crookston hasn’t answered the bell yet and unfortunately look like it’ll struggle to scratch out a win in 2018. Bemidji has lost quarterback Brandon Alt to a leg injury forcing Jared Henning (who played meaningful snaps last season) into action. Henning offers the Beavers more in the zone read running game but doesn’t have the pop in his arm that Alt possessed. Jalen Frye continues to impress running the ball for BSU and the Beavers defense is taking shape. Bemidji has been very fortunate with its young team getting a chance to cut their teeth and gain experience in a season starting out with Northern, Mary, and Crookston instead of South Division foes. These games are allowing a young team to get their feet under them, readying them for tougher tests that’ll follow. I like BSU by a lot here. Wayne State got after SMSU a week ago, aggressively attacking the Mustangs and getting 8 sacks against a young offensive line. In its opener, Wayne struggled to slow down Winona State, and also turned the ball over 4 times. That said, it’s hard to say exactly who the Wildcats are, but they seem better than the bottom half teams but a little bit behind the top squads. Augie has given up 45 and 38 points through two contests. One of those was against Mankato, but the other was UIU. Oddly, AU looked far better in the loss than the win. Last week Kyle Saddler had a watershed performance throwing for 451 yards and 3 scores along with a rushing touchdown, helicoptering into the end zone on the last play of regulation. This certainly has Viking fans wondering if he’s now the next Trey Heid, or if this was just an isolated great performance. Time will tell for the sophomore. Saddler is flanked with a pair of tall wideouts (Meyers and Engel), a similarly sized tight end (Peerenboom), and a very capable slot receiver (Welsheimer). If this group can stay healthy, Augie might have as good a group of pass-catchers as anyone in the NSIC. The Augie offense aggressively attacked the Mavs secondary a week ago, very much aware of the size advantage of their receivers. With Ryan Bradberry (RB) apparently done for the year with a leg injury, Augie needs to keep the passing game going as the Vikings will be young (but dangerous) in the backfield. I think this is the NSIC’s top game this weekend. Part of me doesn’t trust Augie to win on the road despite nearly slaying the top team in the league but I’m going to hang with them. The Vikings should have success through the air against Wayne State, a squad that Saddler threw 7 interceptions against a year ago sin Sioux Falls. I’m taking the Augie Doggies to win a thriller. SMSU allowed 8 sacks a week ago against Wayne. This was the exact concern I had for the return of star QB Blake Gimbel, that he wouldn’t have much time to operate. USF played well enough to beat Winona, but struggled badly with special teams, missing two chip shot Field Goals (28 and 34 yards) that could’ve won the game. USF must get better in the kicking game if the Cougars are going to continue being happy playing a low scoring grinder style. USF has shown it can make some plays down the field through the air but it looks to me the Cougars don’t want to risk turnovers in the passing game. Instead, the offense appears content to hand the ball off to top rusher Gabe Watson. USF should blow SMSU out in this one, but the style the Cougars play doesn’t lend to blowouts. The Coo should still win comfortably. UIU has become the biggest disappointment in the league after two weeks. The Peacocks let Augie off the hook (blowing a 24-0 lead) and then got thumped by an upstart CSP squad. Star running back Ryan Parmely hasn’t played yet, and if he’s out for any length of time, that really hurts the offensive game-plan. The UIU D has taken a turn for the worse allowing big point totals. Winona is trying to make it through with notable injuries to star players DE Michael Gomez, LB Nick Pridgeon, and RB Javian Roebuck. If the athletic Pridgeon (a two time captain) is lost for a good portion of the season, the WSU D will miss his playmaking. Winona escaped against USF (a 16-15 win) but it felt like the two teams were very evenly matched and that the Cougars lost the game more than WSU won it. All said, I still think Winona has better talent on both sides of the ball and will success at Upper Iowa. Keep in mind, with Mankato looming in week four, this contest does have the look of a trap-game for the Warriors. I wouldn’t be shocked if UIU stood up and gave Winona a scare.